Bio: I was born and raised her in Fort Wayne. I graduated from Bishop Dwenger in 2012 and was a member of the wrestling team and soccer team for four years. I then went and wrestled at the University of Indianapolis for two years before returning to Fort Wayne to start working at Personal Training Institute as a personal trainer. I have now been training for over three years and have loved every second of it. On top of training, I am now an assistant wrestling coach at Bishop Dwenger and I am also a recreational gymnastics coach at Summit Academy here in Fort Wayne. Personal Fitness/Nutritional Goals: My personal goal for fitness and nutrition is fairly simple. Long term health is all that I am looking for. I exercise almost daily so that I may maintain a high level of fitness. As for my nutrition I like to experiment with different diets to understand how my body reacts. Favorite Exercise: My favorite exercise is definitely the Pushup. I am not exactly sure why but from a very young age I have always enjoyed them. Least Favorite Exercise: My least favorite exercise is without a doubt Hip Abduction. I have come to learn that I am very weak in this area and I find it to be unbelievably challenging and painful. Hobbies/Life Outside of Work: Outside of training I spend much of my free time coaching wrestling during the fall and winter months. When the weather is warm during the spring and summer months I spend a lot of time at the lake fishing and water skiing. I also enjoy playing golf even though I am not very good at all. 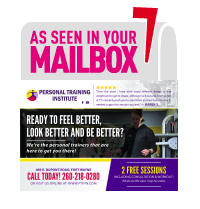 Future Plans: My goal for the future is to stay on the path of personal training and continue to expand the clientele of The Personal Training Institute so that we may continue to impact lives in a positive way. Best Part of My Job: The best part of this job is without a doubt the client interactions. During my time as a trainer my interests have expanded thanks to the wide variety of personalities that I get to interact with every day. The gym is also a very positive environment and it is great to see so many individuals excited to workout. What Should Clients Know About You: I am very passionate about fitness and have a happy personality, so I love to bring a great amount of energy to every workout.